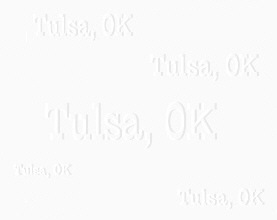 Very few of the county records for Tulsa county have been microfilmed by the LDS at this time. For those that have been there will be a note beside of the listing. The Tulsa County Courthouse is located downtown in the Civic Center complex. Parking is available in the underground parking garage or across the street in a public lot (both have a parking fee). The Main Library is next door to the courthouse, connected by the covered parking area for the Library. If you go to http://www.tulsacounty.org/dtmap.html you will find a map of the Civic Center Complex, the parking areas available and directions to find the courthouse. When requesting copies from the courthouse remember to include a self-addressed stamped #10 envelope. Copies are 1.00 a copy. Guardianship Index from 1951-2001 in book form (available on second floor). Civil Court Indexes 1907-1984 in book form (available on second floor) and are indexed by name, grouped by date (example, first book covers up through 1933 or so, but doesn't indicate earliest date... we assume it's 1907). Available from 1984 to current online www.oscn.net. Judgement Index 1965-1990 in book form (second floor).